Facilities are any location that uses or has its own utility accounts. This usually corresponds to a building or a complex of buildings. Any building that receives any type of utility bill should be added as a Facility. 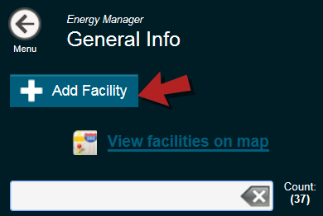 Click on Facility Details and then click on General Info. Select the appropriate Weather Station for this Facility. You will want to select the weather station that is closest in proximity to your Facility, for collecting accurate temperature data. Enter the Current floor area of this facility. This information is used for calculating unit cost/use for reporting purposes. Enter the Year built for the Facility. Enter the Date opened for the Facility. This is the date in which the Facility opened for operation. Select a Facility comparison year. This is the default comparison year when running reports. Next, click on the Addresses tab located at the top of the screen. In the Physical Address field, enter the Address, City, State and Zip. This may be used for visiting a location, determining a meter location, and in Admin reports. 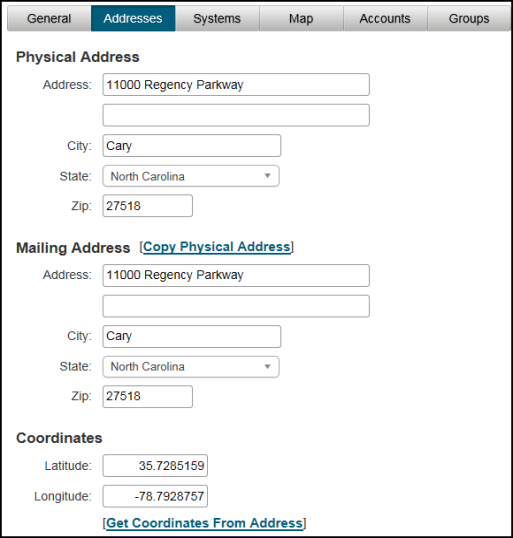 In the Mailing Address, enter the Address, City, State and Zip if it is different than the Physical Address. If it is the same as the Physical Address, simply click the Copy Physical Address button. In the Coordinates section, click the Get Coordinates From Address button. The system will find the longitude and latitude based on the address. You will then be able to see your facility under the Map tab. A pop-up will appear asking if you would like to add another Facility. If you have more than one Facility to enter, then click Yes. If this the only Facility you are adding at this time, then click No. Once you have saved the Facility, you will have access to additional tabs at the top of the screen. 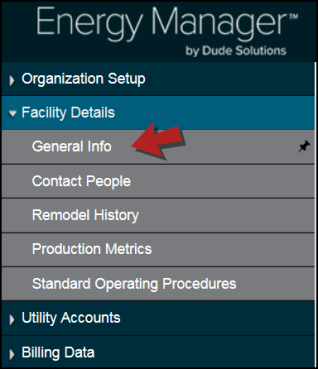 Click on the Systems tab to identify the primary fuel sources for the Facility as well as the lighting and controls managers. This is not a required field in the system and is purely informational. Click on the Map tab to see your Facility on the map based on the coordinates from the address you entered. The Accounts tab allows you to see the utility accounts associated to this Facility. The Groups tab allows you to see the Facility Groups that this Facility is associated with.